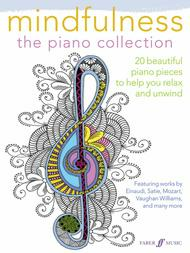 20 Beautiful Piano Pieces to Help You Relax and Unwind. Composed by Various and arrangers. Piano Collection; Piano Supplemental; Solo. Faber Edition. Masterwork Arrangement. Book. Faber Music #12-0571539548. Published by Faber Music (AP.12-0571539548). This collection of beautiful piano pieces provides a unique way for pianists to reach a state of mindfulness by sharpening their musical focus towards their internal and external experiences within the present moment. With the help of Einaudi, Debussy, Beethoven, Vaughan Williams, and Satie, as well as music-themed images to color in, this aid to simple meditation is the perfect musical remedy in an increasingly frantic and pressurized world. Titles: Ambre (Frahm) * Arioso (BMV 156) (J. S. Bach) * Der Dichter Spricht (Schumann) * Earnestly Yours (Henson) * Fantasia on a Theme of Thomas Tallis (Vaughan Williams) * Gnossienne, No. 1 (Satie) * I Giorni (Einaudi) * Lento (Scriabin) * Moonlight Sonata (Beethoven) * Morning Prayer (Tchaikovsky) * Pavane, Op. 50 (Faure) * Pavane pour une infante defunte (Ravel) * Prelude in E Minor (Chopin) * Reverie (Debussy) * Romanze (Mozart) * Shackleton's Cross (Goodall) * Snowflakes (Glennie) * To a Wild Rose (MacDowell) * Une larme (Mussorgsky) * Winter (Slow Movement) (Vivaldi).